Last year, Black Panther took the U.S. by storm and became one of the highest grossing movies of all time. The film was packed with standout characters like Shuri and Okoye, but M’Baku became a surprise scene-stealer. 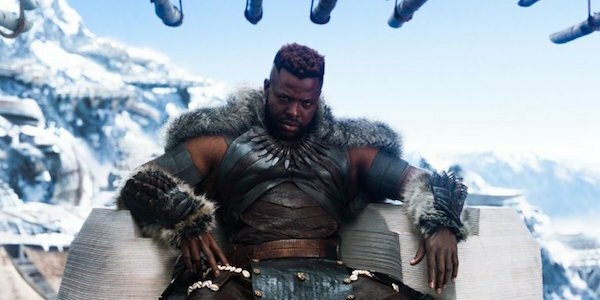 Winston Duke brought some serious charisma to the imposing M’Baku, and while Black Panther helped put the actor on the map, it almost cost him a role in Jordan Peele’s Us. The director said he initially thought Duke might be too tough for the horror movie. Jordan Peele’s highly anticipated (and rated) Us finds Lupita Nyong’o and Winston Duke playing a wife and husband who take their two children on vacation in a beach town, only to be stalked by strangers who look exactly like them. It’s hella spooky and frightening, but I bet you’d feel a little safer if you had M’Baku on your side. Jordan Peele was thinking the same thing, which is why he was originally hesitant about casting Winston Duke in his new horror film. Duke is a physically strong man, so would people be scared for this family knowing the dad fought aliens with the Avengers last summer? Thankfully, Jordan Peele decided that Duke’s charisma overpowered any of his physical might and that he was ultimately a great fit for the role. Just listen to how he sang “I Got 5 On It” in that trailer! That’s charisma city. Also, if the family is attacked by doppelgangers, then that means Duke’s doppelganger is also tough-looking. If the father character was “weaker” or less imposing then the same would be true for the enemy, and then the audience would be left wondering why this guy is supposed to be scary. Either way, Winston Duke is happy that he was cast in the role. He told The Hollywood Reporter that he loved playing M’Baku, but he was receiving offers for a lot of tough guy parts after Black Panther, so he was thankful to get the opportunity in Us.